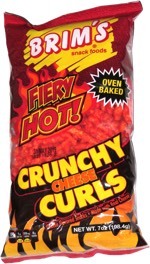 Taste test: These are wide-rippled chips with a whole lot of spicy flavoring on them. There's something about the flavor that's hard to place, but it seems sort of mustard-like — nothing all that honeyish about it. 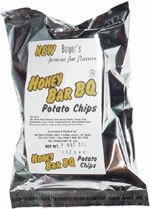 Boyer's puts a ton of seasoning on these, and some of the seasoning doesn't stick to the chips very well, so we recommend carefully eating these on a plate to avoid spreading too much flavor powder all over your snacking area. Smell test: Stong barecbue aroma, makes your mouth water a little.